Beyond Lingmoor Fell on the left is Pike o'Blisco. 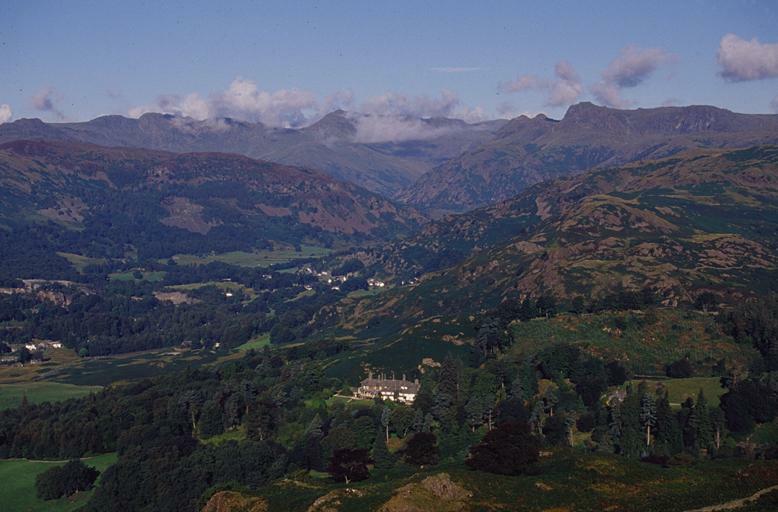 To the right of this lies Crinkle Crags; Shelter Crags, partly obscured by cloud; the gap of Three Tarns; Bowfell; Esk Pike is beyond the subsidiary northern summit of Bowfell, partly obscured by cloud; Great End in the distance; Loft Crag; Pike o'Stickle; Harrison Stickle and Pavey Ark. The building prominent in the foreground is High Close Youth Hostel. Smaller version of this picture.